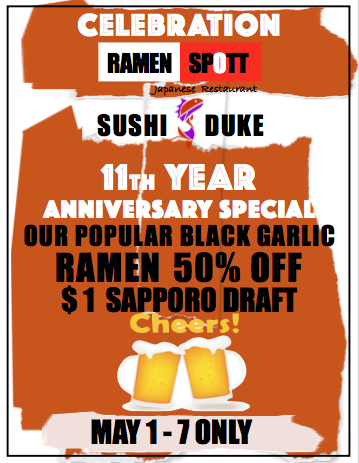 May 1 - 7 | Ramen Spott Offers 50% Off Black Garlic Ramen For 11 Year Anniversary - EAT WITH HOP! This deal is for ramen lovers! Ramen Spott, a ramen and sushi restaurant located in Torrance is offering a special deal to celebrate their 11 year anniversary! To celebrate their 11th year anniversary, Ramen Spott in Torrance is offering 50% off their popular black garlic ramen! I have never been to this restaurant but I do like black garlic ramen in general!